Is Your Story Heard By Your Market? Hey, Atlanta Realtor. The red pill took you into the world of digital, the world of Internet. Are you surviving? Are you thriving? Good news is before digital world and in it people always wanted to work with exceptional companies. But In 2017 exceptional companies usually will have exceptional presence online. Maybe you’ve heard that a good product sells itself. Sorry, it’s not true. The reality is even addictive products like tobacco require some creative marketing to have successful sales. Your amazing product, service or charity will thrive if you tell your story. But how? Marketing methods constantly evolve. In the last 50 years we went from black and white paper ads, to QR-codes, social media and mobile-only tools. What haven’t changed is that people still desire to work with people they like and trust. I want you to think of marketing as a 2-step venture: 1. – helping people find you and 2. – giving them what they want once they find you. What is your story? 20 years ago it was strange when you shared too much about yourself online, but now it is considered strange if there’s no public info about your business or yourself. Think about Facebook, LinkedIn and Instagram. Internet is no longer some mysterious outlet; it is now an extension of your life, your communication with the world, friends, parents and co-workers; Internet is your dictionary, encyclopedia, cook book, shopping cart, research tool, it’s your bookshelf and your stereo-center. 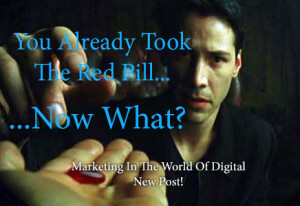 We ALL took the red pill, we are ALL in the world of digital. But not all adapt easily. How can you showcase your red pin and make it stand out on the vibrant map of the Internet? Building a company website is intimidating. From design and layout development to menu and plug-ins set up, it can be overwhelming. If you’ve hired a web-developer, you’ve solved a half of your problems. The other half is – content. Are you a creative copy-writer or blogger? If you don’t provide quality content like write-ups, bios, pictures, videos, service info, history, continuously updated storyline – your developers will have their hands tied. Your content must also be relevant to the context and platform where you choose to share it besides your site. Think about getting help from content and media professional. Learn how to bring your site to life. It can happen naturally when you accept that the Internet is an extension of you, both personally and professionally, and that every day the world is more likely to see that extension of you first. Your content may involve regular copy-writing, personalized photography, video, creative customer loyalty ideas, engaging and offering help – it’s all part of building relationships with your clients. If you are in the beginning stage of your site development and integration with social media, and want to have a strong presence online, let’s talk, I’d be glad to offer a review and ideas.